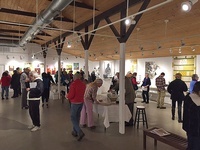 GUILFORD ART CENTER is a non-profit organization that inspires and promotes community participation in the visual arts through education, exhibitions, and outreach. 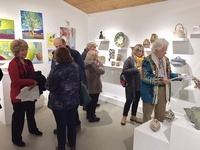 Founded in 1967 (as the Guilford Handcraft Center), the Center evolved from the first Handcraft Expo, held on the Guilford Green in 1957, in which local artisans displayed and demonstrated their crafts. Ten years later, the Center was incorporated and, since that time, has become a vital part of the town and the extended shoreline community and culture. It serves as the most comprehensive art organization, and includes the largest public exhibition space, between New Haven and Old Lyme.